PINK DOLLAR : ANTJE SCHUPP. REGISSEURIN.PERFORMERIN. PINK DOLLAR is a literally queer project. 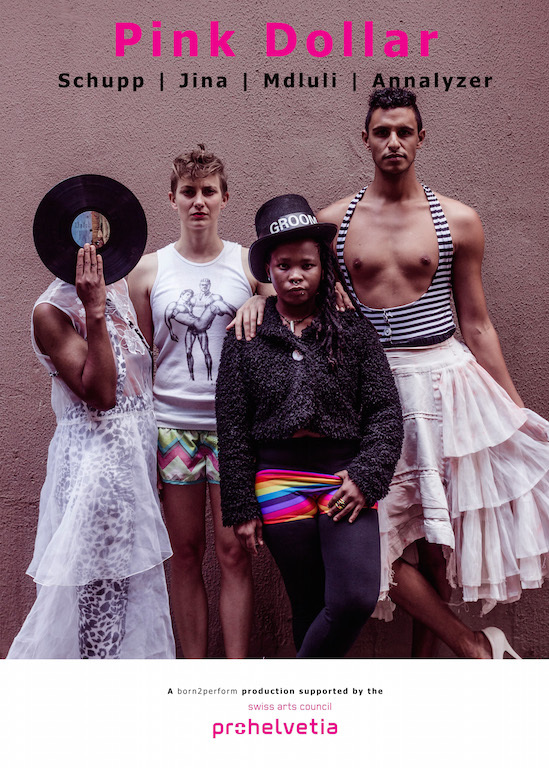 It is an experiment of four artists digging deep into the multilayered topic of pink money in South Africa and how it is related to South African society, its acceptance of homosexuals, trans- and genderqueer people and the still existing differences between a black, a colored and a white community. Maybe some queerness would do good? PINK DOLLAR mixes styles as it mixes the backgrounds of its performers. Club music meets contemporary dance, performance art meets documentary footage, Xhosa songs meet European Rap. The skin color of the people performing shouldn’t matter, but we know, it will anyhow. So you’ll get to see a white European tourist, a black butch lesbian, a colored gay man and a DJ, who doesn’t give a f*** about lables. But she surely knows how to mix.